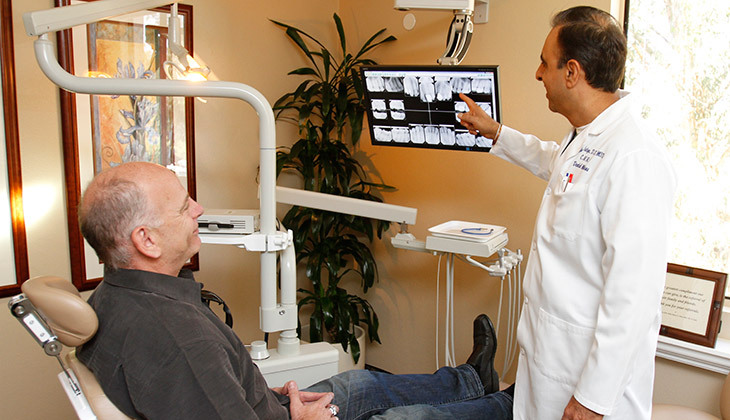 Gum Disease Treatment in Mission Viejo | Orange County Periodontists | Ajay B. Setya, DDS, MSD Robert C. Hirst, DDS, MS Christen S. Bergman, DDS., MS.
Our doctors deliver expert gum disease treatment. Dr. Setya, Dr. Hirst, and Dr. Bergman use the latest in advanced technology to provide effective gum disease treatment using gentle and minimally invasive techniques. Our doctors are specialists in the diagnosis and treatment of periodontal (gum) disease of all kinds, including the treatment of the supporting jawbone and teeth as they are affected by gum disease. They trained for three years after dental school to receive their certification, and stay abreast of the latest developments in gum disease treatment through extensive continuing education. The doctors will go over the exam in detail and answer your questions. Dr. Setya, Dr. Hirst, or Dr. Bergman will do a thorough examination of your gums, teeth and supporting jawbone as your first step in treating your gum disease. They will gently probe the depth of the open pockets under your gum line to determine the amount of gum detachment from your teeth. The deeper the pocket, the greater the amount of gum disease. Full-mouth X-rays will be taken to get a complete picture of the bone levels surrounding your teeth. Where necessary we will obtain a 360° 3D image of your entire jaw using our cone beam 3D CT scanner. The doctor will also check for any loose teeth and will review your medical and dental history. The first line of attack in treating moderate and even severe gum disease is thorough deep cleaning. We use ultrasonic scalers to gently remove the accumulated plaque and calculus on the surfaces of your teeth above and below your gum line. We then smooth the tooth root surfaces using hand scalers so the gums can reattach easily and from a strong bond that will protect your teeth. When warranted, Dr. Setya, Dr. Hirst, and Dr. Bergman will insert antibiotic agents directly into the gum pockets to kill bacteria remaining after full deep cleaning. An antibacterial iodine solution that kills up to 98% of any bacteria that could be present is flushed into the gum pockets at the end of a cleaning session. When long-term anti-bacterial action is called for, the doctor will fill the pockets with Arestin® microspheres that time-release a powerful antibiotic directly into the gum pockets over a ten day period. In certain cases, bacteria cause gum disease that will not succumb to the usual antibiotics and need a tailor-made treatment to be effectively eliminated. When gum disease persists or returns after full cleaning and antibiotic therapy, Dr. Setya, Dr. Hirst, or Dr. Bergman will take a small sample of plaque or saliva and have a lab identify the bacterial strains. The doctor can then prescribe the bacteria-specific antibiotics needed to kill the infection. We use the Perioscope during gum disease treatment to see calculus deposits and deeply buried plaque under your gum line. In a large percentage of cases this allows us to remove deposits without surgical procedures in a large percentage of cases, making our gum disease treatment extremely thorough while being minimally invasive. We educate you on how to maintain your oral health after treatment. Dr. Setya, Dr. Hirst, Dr. Bergman and our hygienists thoroughly educate you on how to maintain your oral health with proper brushing and flossing techniques. They will also recommend the best cleaning devices to use for brushing and for cleaning dental implants. Learn more about our periodontal maintenance here. In cases of severe gum disease or where the gum pockets have not healed adequately after deep cleaning and antibiotic therapy, Dr. Setya, Dr. Hirst, or Dr. Bergman will need to access deeper into the bone defect and around the gum tissue covering the root of the affected tooth. They will then remove all the accumulated plaque and calculus residing on the tooth roots and smooth the root surfaces so the gums can reattach firmly to the teeth. A firm attachment eliminates any pocket where bacteria can accumulate. Dr. Setya and Dr. Hurst use micro-instruments for periodontal surgery. Micro-instruments make minimally invasive incisions that preserve the vast majority of gum tissue and greatly reduce the need for gum grafting after surgery. Gum disease can sometimes cause the gums to recede and expose the roots of the teeth. Gums can also be too thin to protect the teeth and can lead to gum recession. Dr. Setya, Dr. Hirst, and Dr. Bergman can replace lost gum tissue through expert minimally-invasive gum grafting. Learn more about Gum Grafting here. Moderate and severe gum disease dissolves the jawbone supporting your teeth. Dr. Setya, Dr. Hirst, and Dr. Bergman replace lost or missing bone using state-of-the-art bone grafting procedures. Learn more about Bone Grafting here.